We gave Curly and Mister a special Christmas present early. Mister's current fascination with Orcas resulted in asking for a stuffed Orca for Christmas. I managed to find one better on Amazon: an Orca Webkinz. In order to make this long week leading up to Christmas a little more fun, we let them unwrap these last night, so of course they asked to get online first thing this morning. Curly's Ice Dragon and Mister's Orca soon had a virtual home. Although I'm aware that Webkinz is just a game, I see my kids learning vital technological skills, and constantly problem-solving. Some of the pictures Curly "paints" remind me of my own beginning efforts with virtual design, eventually leading to my learning PhotoShop and doing web design, which for years has been a fairly lucrative freelance job. 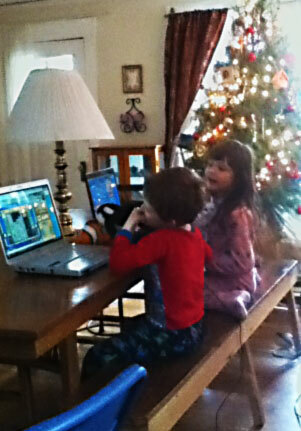 My kids all share one WebKinz account! I'm a little jealous of the Orca. I've been asking Santa to get Angela one for years, because Angela doesn't care about the stuffed animals only the virtual pet, and she gives me the stuffed animals, and I love Orcas!! !